Photographer: Jamie Nelson. Model(s): Jennifer Pugh. Source: Beautiful Savage. Stylist: Jennie Hensler. Makeup: Moises Ramirezart. Hair: Aura, Elsa Canedo. Jennifer Pugh captures the nuance of neon in ‘We’re All Made of Stars’ by Jamie Nelson for Beautiful Savage, November 2014. Take a trip through wonderland as Pugh shows us the artistic side of psychedelia. A dizzying mix of fashion & fun, the future has arrived, with looks that include brass, plastic, metal and fur. Stylist, Jenni Hensler, goes under-ground with eclectic ensembles from Big Park, Cody Ross, House of Holland, Jenni Hensler, Maison Martin Margiela, Religion & WXYZ Jewelry. Neo-noir meets circus-chic, as (Makeup Artist) Moises Ramirezart brings the beauty of modernity to life. 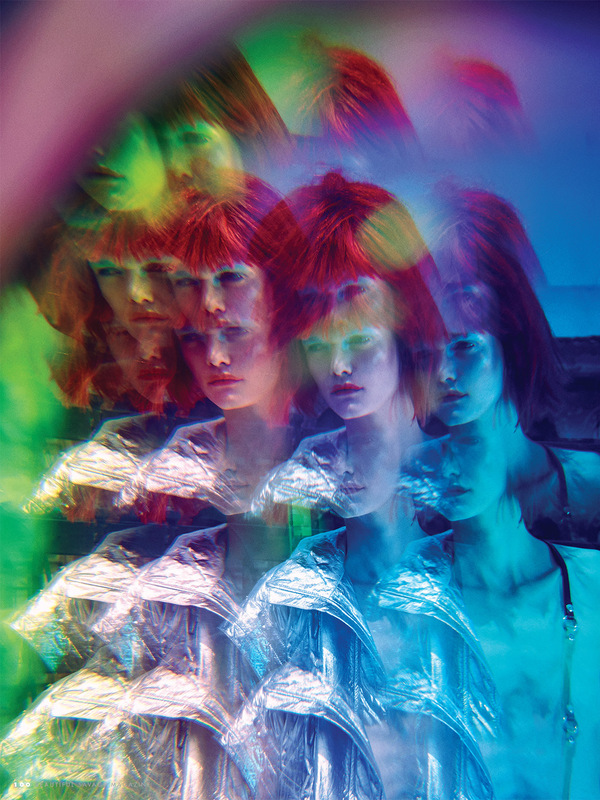 Hairstylist, Elsa Canedo, cuts a wash of wild wigs, as Aura covers them in a kaleidoscope of incandescent colors. The chaos of creativity comes to bare with hypnotic eyes that evoke an avant-garde aire. of a neon filled game.